Elephant Polo. It's exactly what it sounds like. Late August in Bangkok can only mean one thing. It's Elephant Polo season! At just four days, it's admittedly a short season but it's fun for a good cause. Anantara, a family of high end hotels and resorts in Asia, is the chief sponsor of the annual King's Cup Elephant Polo Tournament. It draws polo players from the US and across Asia (seriously) who come for four days of polo action to benefit elephants rescued from abusive environments. Mahouts on their elephants in the corral before the tournament. I know what you're thinking. This sounds like something from The Onion. But elephant abuse in Asia is a big deal. Elephants have a long history of being used as beasts of burden in the logging industry in Thailand, Cambodia, Laos, and Myanmar. Logging is more regulated and mechanized and elephants and their mahouts (trainers) are being pushed onto the streets where they end up begging for handouts from tourists. (I am not making this up.) Ananatara and a couple of other organizations are trying to help rescued elephants. 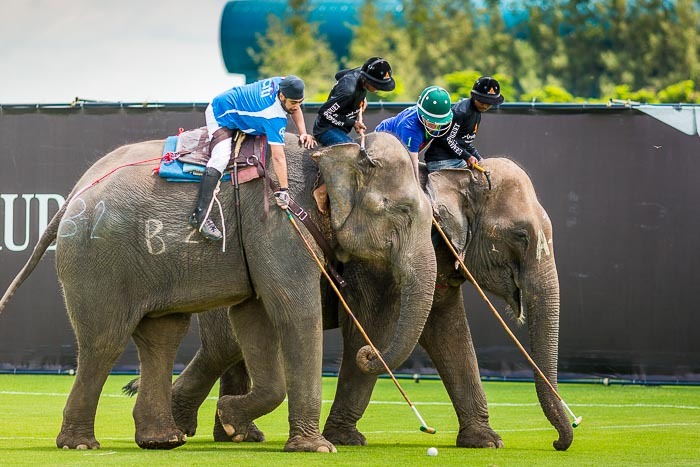 The King's Cup Polo Tournament is Anantara's fundraiser for elephant welfare. 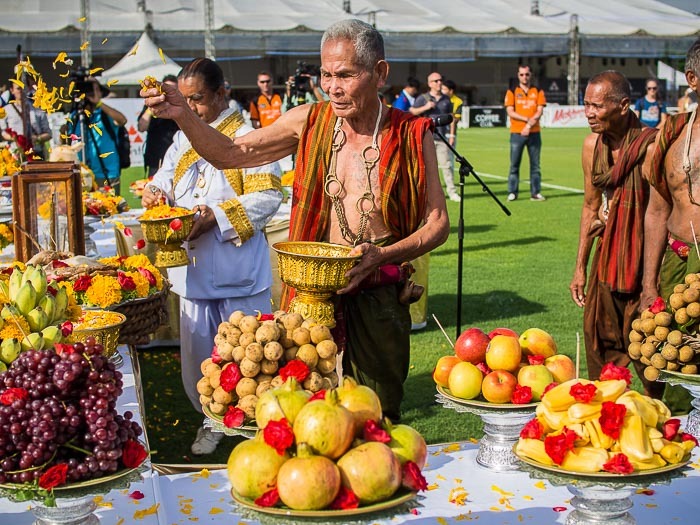 A "Khru Ba Yai," or Elephant Spirit Man, leads a blessing for the elephants before the tournament. 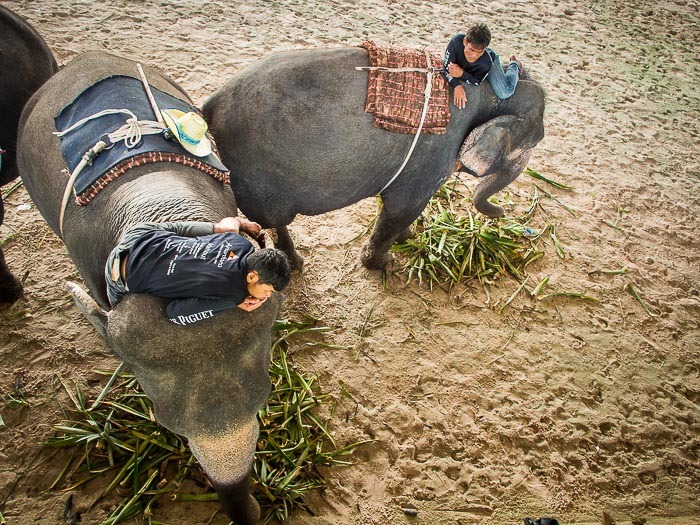 The Khru Ba Yai used to capture wild elephants for the logging industry. There are only a few Khru Ba Yai left since there are almost no Thai elephants left working in the logging industry. Elephant polo is sort of just like horse polo. Horse polo is an exhilarating sport played at break neck speed. Elephant polo is not. It's played on elephants that trundle around the pitch (field). It's so slow the referee runs up and down the field and polices the play not on an elephant or on horseback but on foot. There's more than just elephant polo at the King's Cup Elephant Polo Tournament. There's the elephant buffet (a huge table set with pumpkins, corn, pineapple and other fruit) that the pachyderms munch while people watch and try to make selfies. There's human food, booze and lots more. 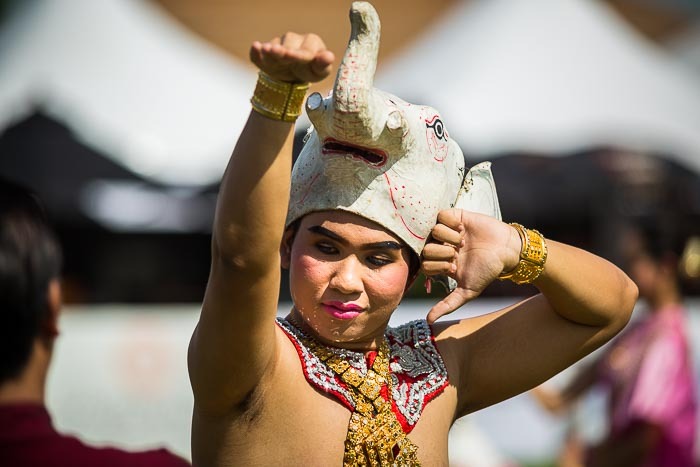 A dancer with an elephant hat channels an elephant. There are more photos of the elephant polo tournament in my archive or available from ZUMA Press.